Although the Gestapo is generally associated with SS Leader Heinrich Himmler, it was actually founded by Hermann Göring in April 1933. Upon becoming Chancellor of Germany, Adolf Hitler had appointed Göring as Minister of the Interior for the State of Prussia, Germany's biggest and most important state, which controlled two thirds of the country, including the capital, Berlin, and the big industrial centers. As Minister of the Interior, Göring thereby had control of the police. The first thing he did was to prohibit regular uniformed police from interfering with Nazi Brownshirts out in the streets. This meant that innocent German citizens had no one to turn to as they were being beaten up by rowdy young storm troopers drunk with their newfound power and quite often drunk on beer. These young Nazi toughs took full advantage of police leniency to loot shops at will and terrorize Jews or anyone else unfortunate enough to be caught in the wrong place at the wrong time. 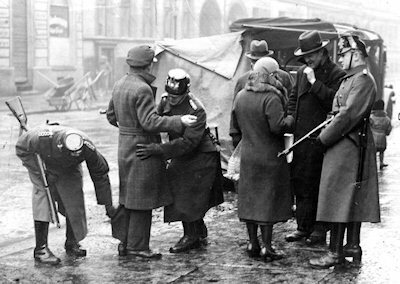 German citizens are stopped and searched by plain-clothes and uniformed police in March 1933 under the pretext they might be concealing weapons. 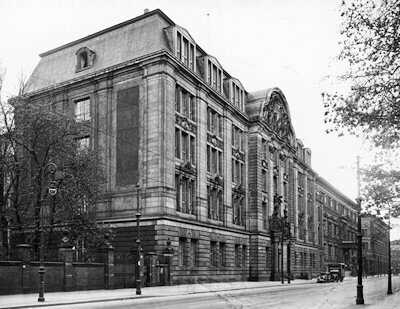 Below: Gestapo Headquarters in Berlin, located at No. 8 Prinz-Albrecht-Strasse - a frightful address from 1933 onward. 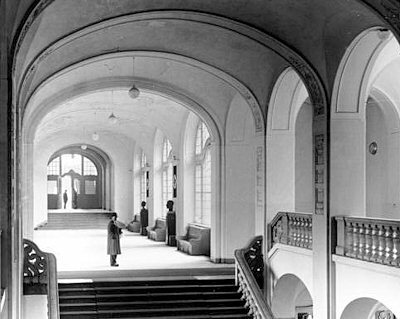 Below: The main hall inside Gestapo HQ - a building that had once been an art museum. Below: Transition of power in April 1933 as Göring (right) yields control of the Gestapo to Himmler. 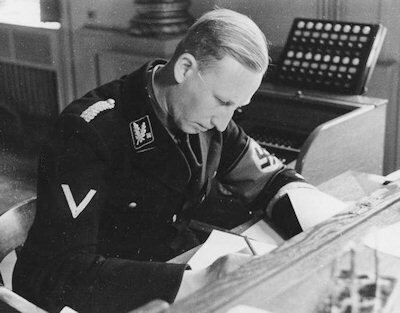 Below: Reinhard Heydrich hard at work in 1934. He displayed genius for creating the vast organization behind the Nazi police state. 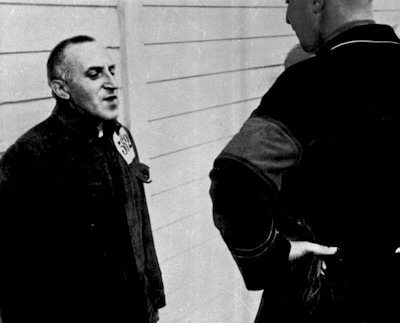 Below: Journalist Carl von Ossietzky finds himself in the grips of Heydrich's police apparatus. As editor-in-chief of Die Weltbühne (The World Stage) newspaper Ossietzky spoke out against militarism and fascism. Arrested the day after the Reichstag fire, he remained in Gestapo custody for five years, despite receiving the 1935 Nobel Peace Prize. Although in poor health, he was subjected to harsh treatment in concentration camps and finally succumbed to tuberculosis in May 1938. Next, Göring purged the Berlin police department of politically unreliable cops and had 50,000 storm troopers sworn in as special police auxiliaries (Hilfspolizei). Now the storm troopers had actual power of arrest and they relished its use. Jails were soon overflowing with people taken into "protective custody" resulting in the need for large outside prison camps, the birth of the concentration camp system. Having compromised the uniformed divisions, Göring next turned his attention to the plain-clothes police. On April 26, 1933, a decree was issued creating the Secret Police Office (Geheime Polizei Amt) which quickly became known as the GPA. But this abbreviation was far too similar to the GPU abbreviation used by the Soviet Political Police in Russia. Thus, the name was changed to Secret State Police (Geheime Staats Polizei). The actual term 'Gestapo' was supposedly created by a Berlin postal official who wanted a name that would fit on a regulation-sized postal rubber stamp. Gestapo was derived from seven letters within the full name Geheime Staats Polizei. Unknowingly, the postal official had invented one of the most notorious names in history. Göring promptly began using the Gestapo to silence Hitler's political opponents in Berlin and surrounding areas and also to enhance his own personal power. Much to his delight, Göring discovered that the old Prussian state police had kept many secret files on the private lives of top Nazis, which he studied with delight. Göring appointed Rudolf Diels as the first Gestapo chief. Although Diels was not a Party member, he had been a member of the Prussian Ministry of the Interior since 1930 and had served as a senior adviser in the police. Göring took full advantage of Diels' knowledge on how to operate a political police force. He also encouraged Diels to maintain and expand the secret files on Nazi leaders. The cunning and ambitious Göring would use that information to help solidify his own position within the Nazi Party. Another ambitious Nazi, SS-Reichsführer Heinrich Himmler, soon set his sights on the Gestapo. A fierce rivalry then developed between Himmler and Göring, with both men working against each other to curry favor with Hitler as to who would actually run the Gestapo. 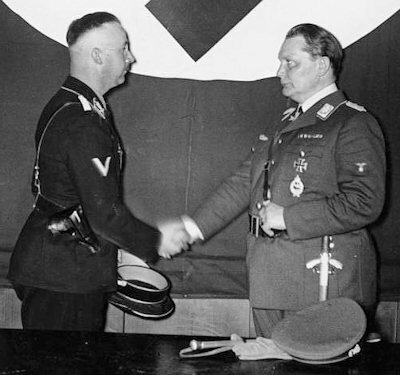 On April 20, 1934, after much infighting, Göring decided to cede the Gestapo to Himmler and his associate, Reinhard Heydrich, who took over as Gestapo chief two days later. The ever-ambitious Göring had set his sights on something much bigger than being a policeman. The former World War I flying ace and recipient of the prestigious Pour le Mérite medal fancied himself as a military leader. He wanted to take charge of a rejuvenated German Air Force. His interest in police matters and the Gestapo had diminished as Hitler's plans for a huge military buildup became apparent. Within a few years, Himmler became Chief of the German Police in addition to his duties as SS leader. Heydrich, his number two man, proved to be something of a genius in creating a hugely efficient national intelligence system that kept tabs on everyone. No one was exempt from Gestapo snooping, no matter how high up in the Nazi hierarchy. On February 10, 1936, the Nazi Reichstag passed the 'Gestapo Law' which included the following paragraph: "Neither the instructions nor the affairs of the Gestapo will be open to review by the administrative courts." This meant the Gestapo was now above the law and there could be no legal appeal regarding anything it did. Indeed, the Gestapo became a law unto itself. It was entirely possible for someone to be arrested, interrogated and sent to a concentration camp for incarceration or summary execution, without any outside legal procedure. Justice in Hitler's Germany was completely arbitrary, depending on the whim of the man in power, the man who had you in his grip. The legal policy as proclaimed by Hitler in 1938 was: "All means, even if they are not in conformity with existing laws and precedents, are legal if they subserve the will of the Führer." Surprisingly, the Gestapo was never actually a very big organization. At its peak it employed only about 40,000 individuals, including office personnel and the plain-clothes agents. But each Gestapo agent operated at the center of a large web of spies and informants. The problem for the average citizen was that no one ever knew for sure just who those informants were. It could be anyone, your milkman, the old lady across the street, a quiet co-worker, even a schoolboy. As a result, fear ruled the day. Most people realized the necessity of self-censorship and generally kept their mouths shut politically, unless they had something positive to say. As the SS organization rapidly expanded in the late 1930s, the super-ambitious Heydrich acquired immense powers and responsibilities. One of his main accomplishments was the reorganization and bureaucratic streamlining of the entire Nazi police state. In September 1939, just after the outbreak of war, he created the Reich Main Security Office (RSHA). This new organization had seven main branches. The Gestapo was designated as the fourth branch and was now headed by Heinrich Müller (nicknamed as Gestapo Müller). Back in 1931, as a member of the Munich police, Müller had successfully hushed-up the scandal surrounding the suicide of Hitler's niece Geli Raubal. Thus he had proven himself to be a very dependable man. Section B4 of the Gestapo dealt exclusively with the "Jewish question" and came under the permanent control of Adolf Eichmann. This energetic and efficient organizer would keep the trains running on time from all over Europe to Nazi death camps located in occupied Poland during the Final Solution of the Jewish question. The Gestapo followed Hitler's armies into every country during the conquest of Europe. By pitting neighbor against neighbor, Gestapo agents established the same kind of terror mechanism in each occupied country that had worked so well back in Germany. In 1942, the Gestapo took things a step further via Hitler's Night and Fog Decree. Suspected anti-Nazis would now vanish without a trace into the misty night never to be seen again. The desired effect as stated by Himmler was to "leave the family and the population uncertain as to the fate of the offender." The victims were mostly from France, Belgium and Holland. They were usually arrested in the middle of the night and whisked off to far away prisons for torture-interrogation, eventually arriving at a concentration camp in Germany if they survived. From the very beginning of Hitler's regime, the ever-present threat of arrest and indefinite confinement in a concentration camp robbed the German people of their personal freedom and left them as inhibited, dutifully obedient subjects. But even this was not enough. The Nazis wanted to change people's thinking. And so, just as they had purged their hated political enemies, they began a campaign to purge hated "unGerman" ideas. That effort started in May 1933 with the worst of all crimes against human thought and culture – the burning of books.